I like Chens print of the italian camo ( hopefully he will produce the panzersuit soon ) and I like also SMW´s print, too ( got a trouser of that print ). Both are correct in their way and both existed about print and size of pattern on original WW2 Zeltbahns. The edges between the print of the three colours are too sharp. I have two original WW2 italian Zeltbahns and have seen more in the past having the same crispness print from which Chens did his repro, but there is allways a litte overprint of the colours over the other colours of about 2 mm in which the colours to blend in, which is typical for the italian telo mimetico pattern. SMW´s print got that overprint between the different colours in a size of 3 - 4 mm because his print is the bigger one. ( see the red arrows at the picture ). I am missing at both prints that the yellow should be more a yellow ochre and not that soft cream ochre. We have to wait to see some pictures of Chens print after been washed several times and be worn in the field. SMW´s trouser faded well like we can see at the pictures uscha meyer shows above. At the end I have to say well done Chen and well done SMW. Both prints are great but need some upgrades. Chen's print is still ok, even if it is crisper. Of the Three originals Telo Tenda Mimetico i have, only one displays the over print that your version does. Two of them have a crisp register, with little or no overprint. Of the two recognisable camo patterns used by the Italians in WW2 (The crisp version and the overprinted version) then i'd say that SM offers the latter, and chen offers the former. . What would be interesting is which pattern would make the best Telo or triangular Zeltbahn. I have a feeling that neither manufacturer ,(Actually, i know for a fact that SM doesn't..), actually produces an Authentic print off the roller. I bet neither repro'd Italian camo shelter would display the tell tale brown strip. Whats interesting to note, is the background colour of your original Telo Tenda (Or Telone... But not Zeltbahn. ). When you look at SM's and Chens, you can see they perhaps both of them should add a little more Dark grey to their green colour when compared to the photo above the comparison photo of your original. Anyway, surely thats enough about Tedeschy uniforms. 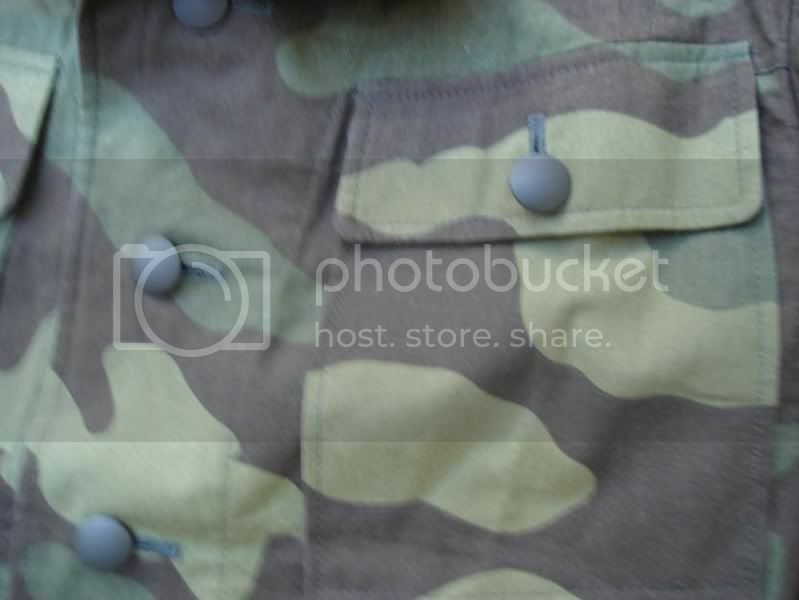 Lets discuss why Chen, Or SM wholesale are not producing the 1941 Camo Paracadutisti Smock. Theres a market for them. Another photo of Chen print, analyze! I think both should only change the cream ochre colour into a more yellow tone. The green - greyish colour varies on all Zeltbahns I have seen so far or own by myself from really a green tone to grey-green to fieldgrey-green. The only constant is the brown which never got a red tone. Allways a burnt umber brown or darkbrown colouration. I said I like Chens print but would really appreciate if he could make that kind of overprint into his second version of his telo mimetico. I think it will look more authentic because of the technology in printing of that time. Now it looks good but too perfect. I will show here a comparison between SMW trouser and one of my original WW2 telone (Zeltbahn). I use SMW´s print not because I prefer it only because I don´t own Chens print at the moment. I only want to show the varies of the green-greyish green tone and the difference in the yellow ochre colouration. That´s all. I am curious how Chens panzersuit will look and what the prize will be. A.Weiss, don´t you got a sharp picture instead of that blurred shot? Would be better. Also here from minute 1.42 - 1.53. Last edited by Caen44 on Thu Sep 24, 2009 6:11 pm, edited 2 times in total. I cannot p.m you. So if you want an answer for the p.m you have send me you have to change your profile. Last edited by Caen44 on Thu Sep 24, 2009 1:41 pm, edited 3 times in total. I want to do an impression to go with a nice ss officers crusher I have, consisting of an 44 blouse and italian trousers but would rather have the insignia of a less "popular" unit. I originally wanted to do Charlemagne, but cookie confirmed they never used italian camo, and I just enjoy it so much it's one of the main reasons for my new impression. So any ideas what division this look would be suitable for? which is preferably a foreign legion such as Flandern, and not 1st or 12th. 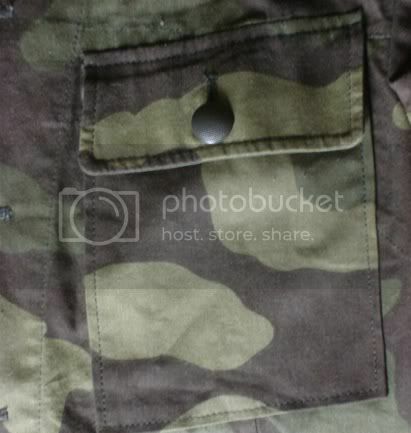 Lets discuss why Chen, Or SM wholesale are not producing the 1941 Camo Paracadutisti Smock. Theres a market for them. I'd like to know why he isn't making the Italian pattern camo trousers. They're the same cut as the M41 wool trousers he makes, so he has the pattern and obviously has the camo. I would think there'd certainly be a market for these as well ...at least among the Italian reenactors. "AMANTI DELLA VITA SPOSI DELLA MORTE"
Contact Chen, it might do for you. mine are WAAAAAAAAAAAAAAy to big , but i am in the process of modifiying them, i have put belt loops on and eventually buttons on the bottom of the trousers and a lip to wrap around the ankle so i can blouse them. The bad news Tom is the FJ wore them loose as you have or with gaiters/low boots! Leave them as they are! Ive a pair and they great! Evidence shows they had them bloused and loose, i prefer to have mine bloused at the ankle, it insured free movement and preserving the ends of the trousers also.